A motorcyclist is being treated in hospital following a collision with a car on the M9 this morning near Stirling. 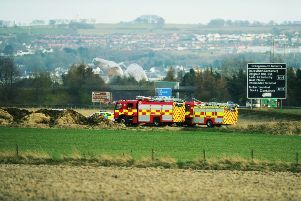 The accident happened at around 10.25am between junctions nine (Bannockburn) and ten (Craigforth). Traffic was brought to a standstill while all lanes were closed for police to carry out investigations. The off-slip at junction ten was also closed for around 45 minutes causing major tailbacks approaching Craigforth roundabout but has also now reopened.